It’s funny how places that figure in our history pop up again as though they’re not quite finished with us; we were through with Benghazi long ago, but it isn’t through with us. There are eighty and ninety year old men in our country who certainly hoped they’d seen the last of that scorched, wind-blasted hovel of a town sixty-seven years ago. It was another time, another age, another war, a dozen chapters or more back in our history. What always comes first to my mind when I hear the name Benghazi, is a long-lost airplane, a crew of dead men, and a mystery that begins in that town on the Mediterranean coast and ends deep in the pitiless heart of Central Libya. 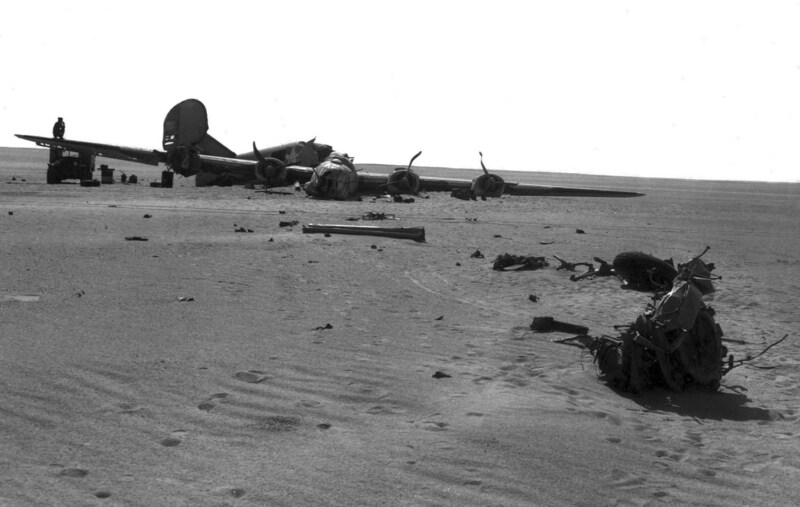 Becoming separated from the other planes of the mission, the novice crew of the ‘Lady’ bombed their target, then turned south towards Benghazi. The sun had set over the Mediterranean. Through a navigational error, a mis-read radio beacon, or plain inexperience, no one knows for certain, the crew missed Benghazi and continued on a course almost due south , into the heart of the most inhospitable desert on earth, the Sahara. From the air, at night, the sand dunes can closely resemble waves on the sea. The crew believed themselves to be over water when they parachuted from their aircraft which was beginning to run out of gas. Landing on the desert, by flares and pistol shots, the men gathered themselves together and took stock of the situation. There were eight of them, the bombardier wasn’t found. Between them they had one canteen of water. Tearing the parachutes into strips, they laid out markers to indicate their direction of travel for any rescuers that would surely be looking for them. Believing the coast to be near, they started walking north into the desert, stopping occasionally to lay out more markers. Though the air field did send out search planes when the ‘Lady’ was overdue, they never saw the crews markers. They were eventually found, by chance, by a British oil exploration crew, fifteen years after the eight young men marched north into the desert. The first marker was 440 miles from the coast. The ‘Lady Be good’ was found twenty-five miles south of the marker, laying largely intact in the sand; it had slowly glided down on an even keel untill it landed itself. When inspected fifteen years later, the radios were in working condition, water and food found in the wreck was still usable, and the guns were operable. Working north from the markers the searchers found where the crew had fallen; five of the men made it eighty miles on a capful of water a day. Three went another twenty miles before they fell. The bombardier was found a mile or two from the first marker; his ‘chute had not opened fully and he likely died on impact. Men who know the desert and what it can do to the human body and mind, were astounded that the airmen made it as far as they did. By all rights the crew should have been found twenty or thirty miles from the starting point, not a hundred. It was an effort of heroic proportions, worth remembering. But it is also a grim lesson; There are some mistakes that will not be forgiven no matter how noble the cause or the men who make them. The bodies of all the crew, save one, were recovered from the barren sands of the Libyan desert and laid to rest beneath the cool green earth of their native soil. It would be nice to think that their spirits are at rest as well, and not forever wandering the desert, eternally striving towards a salvation that forever eludes them. Benghazi is in the news again. Another mistake was made, more good, decent men lost their lives striving to reach safety against impossible odds. The difference this time is that we knew exactly where they were, and precisely what it would take to bring them to home. Posted on November 3, 2012, in Where This Road Goes and tagged aviation, Benghazi, Lady Be Good, Libya, Libyan, mistakes, Naples, Sahara, United States, waves on the sea. Bookmark the permalink. Leave a comment.